As Founder of a The Diabetic Kitchen, a Diabetic Awareness and Education Group I’m extending an invitation to you, to participate in this week’s activity of Honoring Our First Responders across Iberia Parish. I received a request asking me to help organize a community program to recognize 9-1-1, or The Tragic Events Surrounding September 11, 2001 in New York City. I accepted the request and focused on Honoring “FIRST RESPONDERS.” Between the time I received the request and now the Historic Floods came and the work of “First Responders” along with the “Citizen Army” went into full effect and the project was shelved, unintentionally but it was placed on a back burner. If any of you are a FIRST RESPONDER or are Friends With A FIRST RESPONDER Please Share This Invitation With Them. Trust me, this type of invitation is one that I hate most because someone is always left out, however, if that is the case here, chalk it to the Head and not the Heart. 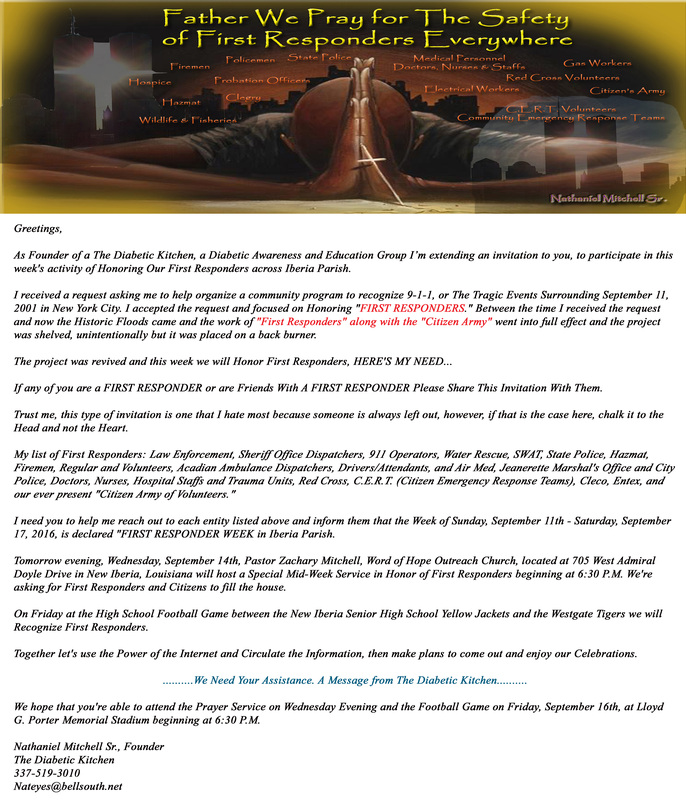 I need you to help me reach out to each entity listed above and inform them that the Week of Sunday, September 11th – Saturday, September 17, 2016, is declared “FIRST RESPONDER WEEK in Iberia Parish. Tomorrow evening, Wednesday, September 14th, Pastor Zachary Mitchell, Word of Hope Outreach Church, located at 705 West Admiral Doyle Drive in New Iberia, Louisiana will host a Special Mid-Week Service in Honor of First Responders beginning at 6:30 P.M. We’re asking for First Responders and Citizens to fill the house. On Friday at the High School Football Game between the New Iberia Senior High School Yellow Jackets and the Westgate Tigers we will Recognize First Responders. Together let’s use the Power of the Internet and Circulate the Information, then make plans to come out and enjoy our Celebrations. ……….We Need Your Assistance. A Message from The Diabetic Kitchen………. We hope that you’re able to attend the Prayer Service on Wednesday Evening and the Football Game on Friday, September 16th, at Lloyd G. Porter Memorial Stadium beginning at 6:30 P.M.
We gratefully appreciate you partnering with us and its with and through the support of people like yourself that "The Diabetic Kitchen" will continue to grow and extend needed aid to the many Men, Women, and/or Children who suffer, needlessly, the ravages of Diabetes.